Prof J P Singh Joorel has been appointed as Director of UGC’s Information and Library Network Centre (INFLIBNET), Gandhi Nagar, Gujarat. The appointment will be for five years and his emoluments will be the same as those of the Vice-Chancellors of Central Universities. 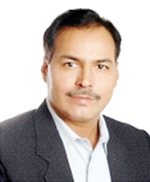 Prof. J. P. Singh Joorel was the former Dean, Faculty of Mathematical Sciences at University of Jammu, India. Previously, he has also held responsible positions such as Chairman and Member, UGC Expert Committees to evaluate the performance and academic attainments of the College for the conferment of Autonomous Status to the colleges, Member, UGC SAP Expert Committee in Statistics, Member, UGC Expert Committee for selection of fellowships to the students, Member, UGC Expert Committee for grant distribution to the colleges of Delhi and worked at various positions in different universities such as Jammu University, Jammu, J&K; Dr Y S Parmar University of Horticulture & Forestry, Solan, Himachal Pradesh; Panjab University, Chandigarh; Agra College, Agra, Uttar Pradesh etc. He pursued Ph.D. degree from Institute of Social Sciences, Agra University, Agra; M.Phil. from Meerut University, Meerut and M.Stat. from Institute of Social Sciences, Agra University, Agra. He supersede Dr. Jagdish Arora, who served as Director of Information and Library Network (INFLIBNET) Centre, Gandhinagar from August, 2007 to 2018 and a well known face in India and abroad. Best wishes and heartiest congratulations to the new Director of INFLIBNET, Prof J P Singh Joorel Sir. Library profession met with another mathematician, I wish our profession will touch another higher levels in your tenure and we will overcome on the existing hurdles in the profession. I quote here that Dr. Arora Sir has inspired and motivated us in various aspects of LIS and research activities. Working patterns of INFLIBNET is set to be an example and model for other organizations. With all other scholarly and keynote developments, ESS(E-Shod Sindhu) is one of the very essential and effective gateways of e-resources (benefiting education institutions in India) is one of his recent contributions. Sir has inspired us to do more than what one can do. I am proud LIS professional of his time. Currently, LIS profession is in various instabilities of pay-scales, ambiguous promotion policies, no proper staffing patterns in Libraries, and faded freedom for pursuing higher education for working Librarians. With this, I congratulate Prof J P Singh Joorel Sir. In my opinion a librarian ( according to my view assistant professor in library science) should be a vacational not non- vacational academic staff & duty hours should be same as other faculty, because when there are holidays in academic institutions then librarians are treated as non teaching staff whereas there should be non academic staff in library also as the clarical staff, librarians should be allowed minor and major research projects, we and our national organisations should take steps to improve our status on priority basis . Thank you for the motivating and supportive words, Maám. I shall request Dr. Barman Sir to lead the LIS Links members' regards, greetings and congratulations the new Director of INFLIBNET. This way we may share our professional concerns also. The status and cadre of any person always recognized by his/ her work and profession in our society. The people think that a person is low educated, baldness, holding 10-15 keys in his hand will be the librarian. This is a common perception about librarians from a long time in our society. The image of librarian is like a store keeper and custodian in our society. It is very difficult to change their opinions, once formed because public have formed a permanent image and perception of librarians in their minds.In olden times, a person who is low educated could be considered fit to the work as a librarian. His/her main job was to take care of the keys of the almirah and act as a custodian of the books. This stereotype image of librarian is still in society because Layman never directly came across in the contact of librarians. But is this image of librarian is true ???????????? Certainly not... because , Now library professionals are highly educated and they are well professionally trained and qualified having Doctorate degree, UGC NET, Masters in Library and Information Science, Diploma or degree in Computer Science, Automation etc. Today librarians are not the custodian of books, now he or she is the Knowledge Manager to spread the information for the user satisfaction.The have equivalent qualifications, pay scales . cadre, responsibility and job requirements etc at par teachers. All other departments re-designating various post like rail driver to Loco Pilot, daroga to Inspector, clerks to UDC/LDC, Collector to District Magistrate, Lecture /reader/ Professor to Asst/Asso and professor, bank cashier to Cash officer etc and many more examples according to meet new challenges and job requirements of their profession. But still we are the Librarians, librarians and librarians from school to university, research laboratories AIIMS. This very bed news for Library Profession .. I heretiest congratulation to Dr.J.p.Singh Jooreal,as a INFLIBNET New Director..
Only time can prove or disprove it! Dear Pardeep, I am aware of this fact. However, I believe we should accept the things that we cannot change and “be thankful for each new challenge because it will build your strength and character”.